1. 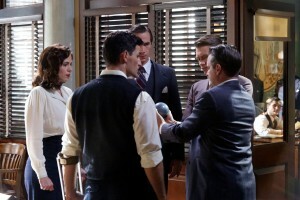 (1.06) “A Sin to Err” – While Agent Peggy Carter and Howard Stark’s valet Edwin Jarvis investigate a mysterious woman whom Stark may have dated, Chief Roger Dooley and the rest of the Strategic Scientific Reserve (S.S.R.) staff begin to suspect that Peggy might be a traitor in their midst. 2. 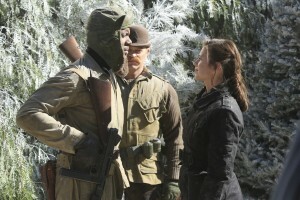 (1.05) “The Iron Ceiling” – After a message from the Leviathan intelligence agency is decoded; Peggy, Agent Jack Thompson and the Howling Commandos investigate a Soviet military complex to stop a possible sale of Stark’s missing weapons. 3. (1.08) “Valediction” – In this season finale, Peggy and her fellow S.S.R. agents race to stop a pair of Leviathan agents from kidnapping Stark and dumping lethal gas on the population of New York City. 4. (1.04) “Blitzkrieg Button” – Stark briefly returns to New York City in order to instruct Peggy in getting her hands on one of his weapons, now in the hands of the S.S.R. Meanwhile, Chief Dooley travels to Germany to interview a convicted Nazi military criminal about the Battle of Finow, in which most of the Soviet troops were massacred. 5. 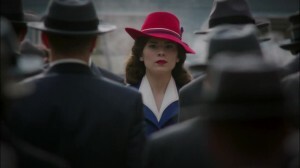 (1.01) “Now Is Not the End” – The series premiere features Peggy, who is still grieving over the “death” of Steve Rogers, arriving at her new assignment with the S.S.R. in 1946 New York City. She is also recruited by Howard Stark, who is suspected of selling his weapons to the Soviets, to find out who had stolen them. 6. (1.07) “SNAFU” – A suspicious Chief Dooley and the other S.S.R. agents interrogate Peggy about her connection to Stark and Leviathan. Meanwhile, the Leviathan agents get their hands on the lethal gas that had been responsible for the massacre at the Battle of Finow. 7. (1.03) “Time and Tide” – Jarvis is interrogated by Thompson regarding Stark’s whereabouts. Meanwhile, the S.S.R. discover a typewriter used to exchange coded messages by the Leviathan agents. 8. (1.02) “Bridge and Tunnel” – Peggy and Jarvis set out to find a missing truck filled with nitramene weapons.